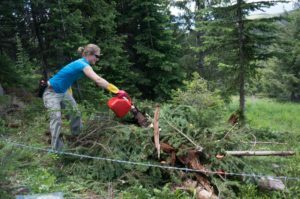 Bait sites and rub trees are both ways in which scientists from SRGBP collect hair, and the DNA it contains, for genetic analysis and isotope sampling. Bait sites are locations where hair can be collected from bears using barbed wire. In the center of the bait sites there is usually a stacked formation of logs on which the bait can be placed. The bait used in our study area is rotten cows blood. This extremely detectable smell will attract bears in the local area, who come to investigate. Around the bait site barbed wire is placed in a triangle or square formation essentially forming a thin fence of wire. When bears come to investigate the bait smell hair is caught on the barbed wire and ripped from the fur. This hair can then be later collected for analysis. Similar to bait sites, rub trees are another way for scientists to collect hair from bears using barbed wire. 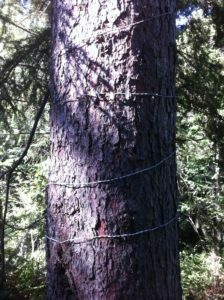 Instead of building a fence around a bait rub trees feature barbed wire wrapped around the trunk of the tree. It is thought male bears use rub trees to scent mark within their territory, although female bears have also been observed to use rub trees. Scientists are able to identify trees which are used regularly and these are the trees that are used to collect hair samples. As with the bait sites, hair is caught on the wire wrapped around the tree and this hair is later collected by our scientists or volunteers for later analysis at the lab.